Eighth-grader Richie Mallon has always known he was a shooter. He has practiced every day at his driveway hoop, perfecting his technique. Now that he is facing basketball tryouts under a tough new coach, will his amazing shooting talent be enough to keep him on the team? 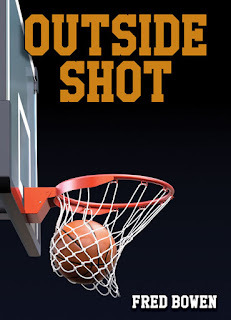 Inspired by the real stories of great shooters like Larry Bird, John Stockton, and Steph Curry, Outside Shot reminds readers that the best players in basketball didn’t just shoot—they played the whole game. They weren’t just stars; they were also team players, as the title’s nonfiction back matter proves. Author Fred Bowen, lifelong sports fanatic and kids’ sports columnist, continues his Sports Story Series, debuting a new look for the series full of fast-paced sports action and told in a new, engaging first-person format. Outside Shot will capture the attention of both basketball fans and the most reluctant of readers. Add this title to your March Madness bracket when it storms the courts of your local libraries, indie bookstores, or Barnes & Noble! And for those students, and instructors, whose lives are “nothing but net,” check out the Teacher’s Guide for Outside Shot, written by the author himself!